Dive pioneer Peter Hughes sat down with X-RAY MAG to give insight into his 40-plus years in the dive industry, what has inspired him and his thoughts on the future. X-RAY MAG: What does it do for you? PH: Major stress buster! Allows one to clear one’s mind of just about everything except the “here and now” of the experience at the time. X-RAY MAG: You have spent 40 years in the dive industry. What have been the highlights? PH: My greatest “high” or achievement after so many years might be receiving the 2011 DEMA Reaching Out Award and being entered into the Diving Hall of Fame. X-RAY MAG: And lows? What are the most significant lessons you have been able to draw from your long career? PH: There have been many highs and, indeed, many lows over those years. One lesson that I think I learned early on is to always face your “lows” (and highs) with honesty and integrity, and in the end, you will persevere. X-RAY MAG: Is there any particular wisdom or advice you would like to pass onto start-ups in the dive industry? PH: Remember, it is a business—not a hobby! Good business practices must prevail if you want and expect success. In my side of the business, the customer is priority number one—treat them at all times as you’d want to be treated when you are on vacation. Remember always that your job is their vacation. They have entrusted you with their hard earned dollars and their equally valuable time. You have a responsibility, having accepted both to deliver what is expected. Again, honesty and business integrity must always take precedence over ducking the truth, or your responsibility to your customer. Think of them as invited guests in your home. X-RAY MAG: You mentioned to me, that watching Jacques-Yves Cousteau at a young age had a great influence in setting you off on a career in recreational diving, and you are not alone. I have spoken to many other dive industry veterans who say the same thing, and his TV shows were an early inspiration for me, too. It seems to me that he probably did more for making diving a popular past-time than any other person, living or deceased. But most people under 40 only seem to have distant notion of him. PH: So true. As I clearly seem to remember it, my father who never dived, saw my immediate love of the ocean as soon as we boarded that 11,000 GT oil tanker in Sept 1951 on our family voyage of immigration from the United Kingdom (Scotland) to Trinidad and Tobago and did everything to encourage it—teaching me to swim aboard the ship in their above deck, canvas, salt water pool. It was within only a few years, as I became an accomplished swimmer, that he bought my first pair of goggles (no mask), a nose clip (which looked like a clothespin with pads), and a snorkel (a long aluminium S-shaped tube with a simple mouthpiece on one end and a rubber cage with a ping-pong ball in it to prevent ingestion of water. On the other hand for my tenth birthday, he bought me Jacques Cousteau’s, Silent World, and I was hooked for life! 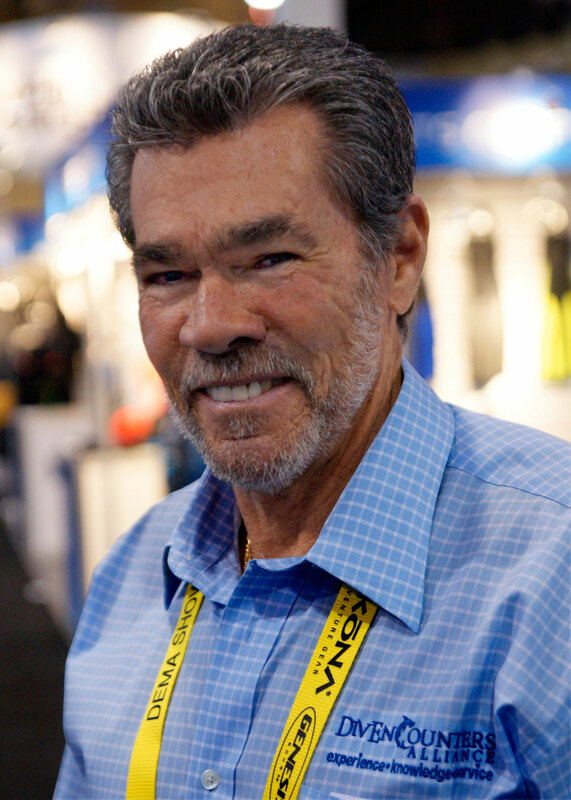 X-RAY MAG: What is your take on his influence on the steady growth of diving in the late 20th century and the subsequent on-going contraction of the dive industry we have seen since the turn of the millennium? Considering that the downward trends in our industry began many years before the onset of the current financial crisis and also went on during the early years in this century where the general economic climate was quite positive. How much do you think we can attribute to the ‘Cousteau-effect’ fizzling out? Are role models and public figureheads really all that important? Or should we predominantly look into more mundane explanations such as bad management, or the sport just falling out of fashion? PH: I think the Cousteau-effect and the Mike Nelson television series Sea Hunt-effect, for example, brought diving and adventure into the minds and homes of millions. We have nothing like that any more. Diving has maybe lost the glamour of adventure and is seen as something too mundane for adrenaline junkies. Back at the beginning when Cousteau gave us the regulator—I still have my Calypso camera from the mid-60’s—things were simple, different, new, exciting. I learned to dive wIth a double hose regulator. 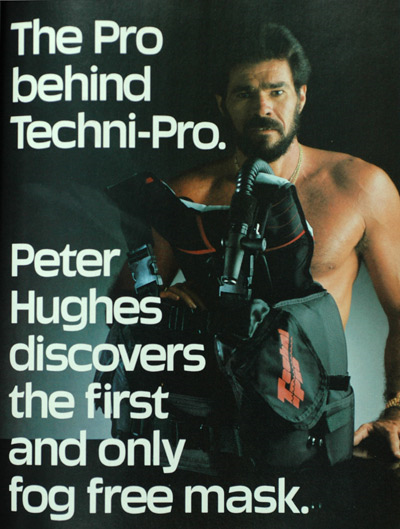 I still have two perfectly good ones, a harness—I had to learn how to use a safety hitch for quick release in case of an emergency—a J-valve (which mechanically gave you 300 psi after it became hard to breath—plenty of time to ascend safely), and a weight belt (always worn over the crotch strap of the harness so it could be dumped in an emergency). Today, diving has perhaps and unfortunately become a bit mundane, as you put it. Nothing terribly exciting and nothing really new—except for, of course, the dive computers, and thank God for them—has come on line. We are just trying to build a better mouse trap. Those into rebreathers and technical diving will disagree with me—and I can agree with them—but rebreathers and technical diving is not for the mainstream, not for the majority. Diving has become an increasingly expensive sport-hobby-activity. So perhaps, with this said, much of the excitement has gone, in this respect. But, the good news is that the underwater experience is now easier than ever. Diving can be a family activity like few others. Four generations can dive together, all together, on an even playing field in many world-class dive destinations, and the better mouse traps that the manufacturers are coming out with make diving so very much safer for all to enjoy. X-RAY MAG: What was your first dive like? PH: WOW! That was in 1957—some 55 years ago—off the beach in Tobago at a place called Batteaux Bay. I was taught by one of the YMCA’s earliest instructors, a man called Bill Petry. We still keep in touch today. Bill is about 85-years old living in La Grange, Georgia. The only time I have ever remembered feeling quite as excited was maybe when I made my first solo flight in 1981. I am sure I was terrified on that solo flight, but there was absolutely no fear on that first dive and after it. At ten years old, I knew I wanted to be a diver when I grew up. I started a career in diving, and at 17 years old, I was an apprentice diver on the dock in Port of Spain, Trinidad, working for South American Marine Operators and Salvage, Ltd., making TT $50.00 a week—about US$25.00 a week at the exchange rate at that time. I loved it, but the job did not last. One year before hard times hit the company, I was laid off at only 18 years old. My father now insisted I get a real job and used his influence with Texaco Trinidad, Inc—the American oil company that had bought the British oil company Regent Oil that my parents immigrated to Trinidad to work for—and I entered the oil industry as an apprentice oil field production engineer. This lasted until I was 21 years old, when the call of the ocean was too great. I quit and returned to Tobago to work for the man that had taught me to dive, and my career in recreational diving was off and running—been at it ever since! X-RAY MAG: What is the best memory or experience diving has been giving you? PH: This is difficult to answer. I have had many, many exceptional experiences. Along the way, I have lost hundreds of thousands of dollars and gone broke a couple of times. I have made excellent money from time to time, too. I lacked any type of advanced education but learned along the way from my better educated colleagues and even served as Vice President, an officer of a public company for five years. I learned so much while there about business, but I also learned corporate America was not for me. X-RAY MAG: Are there any new places you would like to see? PH: Due to my choice of career, I have been more fortunate than most. I have dived in so many exceptional places, but I am always ready for a new dive experience—as long as the water is clear and warm-ish! This becomes ever more important the older I get, and I’m not sure I’ll ever get excited about cold water diving. X-RAY MAG: What were the differences in creating your former liveaboard company, Peter Hughes Diving/Dancer Fleet, and setting up DivEncounters, and how did your past experiences aid you in setting up your new venture? 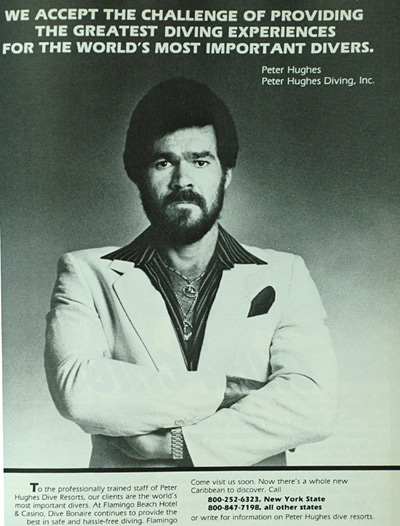 PH: Peter Hughes Diving was the U.S.-based marketing, sales, reservations and management company for the entire Dancer Fleet. At its prime, there were eight vessels in the Dancer Fleet, and all were controlled by Peter Hughes Diving.Five of the eight were owned directly by my wife, myself and the bank, and three were operated under a marketing/management agreement. This business model allowed for Peter Hughes Diving to make all but the most basic sales and operational decisions for all vessels in the fleet. We set what I call cookie cutter standards that all vessels had to comply with—sometimes a good thing but more often a bad thing, as no two vessels or destinations are ever the same environmentally, geographically, politically or socially, and that could and did lead to problems. It also had certain on-board advantages, and the Fleet prospect developed a certain trust along with expectations from our guests. It was a full time and never easy task to maintain those standards and meet those expectations, and I think we did a darned good job. But after so many years at the helm, and seeing the different economic conditions developing, I felt I could do things differently and better. So, I sold my company in 2008, remained employed as president for two years to assist the new owner wrap his arms around it, and resigned in 2010. Knowing the Fleet mentality, knowing the Fleet operations strengths and weaknesses, I was confident I could build a better mouse trap. With this conviction, I set about approaching who I had come to recognize as the “Best Live-aboards in the Best Destinations” around the world with my plan and idea for the DivEncounters Alliance, taking full advantage of the upsides to a fleet approach but dumping the many downsides, encouraging independent owners and operators—all experts in their respective areas—to come together, offering an Alliance of experience and expertise, with all the guest advantages of fleet operations but none of the disadvantages. With the Alliance, the partners benefit from each other’s extensive experience, as do our guests. Our guests also benefit by way of our Alliance Awards program. Through the Alliance, guests can travel with a great sense of confidence when choosing an Alliance vessel for their live-aboard vacation. X-RAY MAG: What kind of commonality do the DivEncounters partners share, or what criteria must potential new partners meet to join the alliance? PH: All partners have been deemed to be the most, or at least among the most, experienced in their respective area. All must have an unquestionable business reputation. All must have all operating permits, licenses, etc, firmly in place. All must adhere to recognized safety standards, as determined by the IMO (International Maritime Organization). All must own and operate a vessel of modern standard and capability. All must recognize the value of their partners to them and of them to their partners, and so never see any as a competitor but as an ally. This allows for some incredible cross-marketing opportunities and builds a sense of confidence in the Alliance within the consumer side of our industry. X-RAY MAG: I understand that you were a primary consultant in the design of M/V Galapagos Sky. Which particular considerations go into the layout of a live-aboard vessel? PH: Correct. The M/V Galapagos Sky was launched in 2000-2001 as the M/V Sky Dancer, operating with me in the Dancer Fleet under our standard marketing/management agreement until 2010, when the owner decided to trigger his escape clause in the Dancer Fleet agreement and join us as founding member of the DivEncounters Alliance. 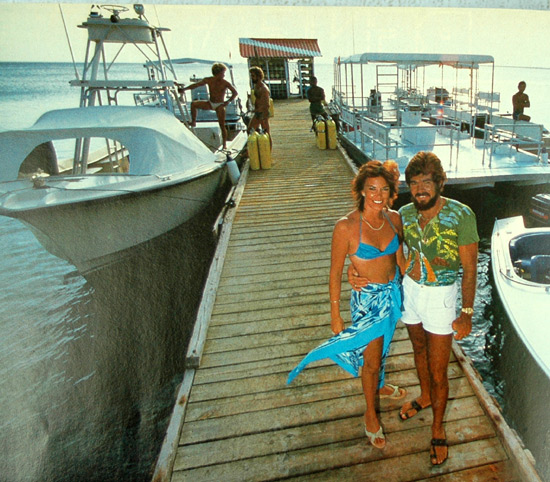 It was in late 1998-early 1999 (approximately) that the owner approached me in my Miami office with his plans to expand his Galapagos operation from three beautiful and very successful 20 pax live-aboard eco-yachts with a live-board dive yacht. We worked on the blue prints together with his naval architect over several weeks, changing the excellent but basic eco-yacht into a luxury, purpose-built live-aboard dive vessel. There were many criteria that we looked for, but first and foremost was guest comfort and convenience while never compromising on safety for either. The words, “guest comfort and convenience”, cover just about everything, as the details include everything from dive deck layout, to galley layout, to cabin format, to en-suite facilities, to safety equipment, to engines, generators, compressors, water makers, etc, etc. A good liveaboard dive vessel is a working, self contained boat, giving the guests on board a yacht-like living experience between their dives. X-RAY MAG: In which ways are today’s clientele different from the early customers? Are their expectations and needs different? Do they now come already equipped with a better or different environmental understanding and awareness? PH: There are two answers to each of your three questions: yes and no. For the most part, today’s clients, or guests, are very different from those from the earlier days. But refreshingly, sometimes there are those that are almost exactly the same. But these are in the minority. Today, many more women travel on liveaboard dive vessels than in the early days, and I think my wife is greatly responsible for this. In 1991, with only the M/V Sea Dancer in our fleet, I told her I intended to build or convert a second liveaboard. After telling me that I was “nuts”, she further informed me that if I was indeed intent on such a silly idea, I “better damn well build a boat she could live on when we went broke”. And she immediately got involved in integrating the “comforts of home” into our second vessel! These comforts of home have since become the benchmark for the industry. With this upgrade to the industry benchmark some 20 years ago, guests today have much higher expectations of what their living quarters will offer while on board, including their culinary expectations (there are some amazing dietary request sometimes, with guests forgetting that many liveaboards operate in truly third world countries), ease of and access to the diving, etc. Environmentally, thankfully, many are much better informed and therefore caring. But unfortunately, we still see too many poorly trained divers with little or no buoyancy control, doing damage to the environment. Others are too intent on their own pursuits to care. But again, thankfully, these are the minority. Divers are the world’s eyes to our deteriorating ocean conditions and are our best ambassadors for change. X-RAY MAG: I have often heard that people may i.e. put off getting their kitchen renovated for another year, or not get a newer car model, rather than give up their vacations, or trips, or down-size a bit and go for a cheaper offer. Do you recognise this picture, and going forward, how do you respond to the challenges of the current economic climate? PH: We certainly see the trend referred to and realize the discounted trips present a challenge. We respond by our educational efforts: price vs value—know the difference. Yes, in the short term, deep discounts as we see flooding the market these days look good to the consumer, especially those with a limited vacation budget. But the reality is, we know what it costs to operate a world-class liveaboard dive vessel. And while (as aforementioned) no two destinations are ever the same costs are higher today, everywhere, than they have ever been, none of us get into business for “charitable purposes” only, and so have the right to make a reasonable return on the considerable investment represented by the costs involved in owning any decent liveaboard dive vessel. If a reasonable price and therefore return on investment cannot be realized, then something must give. I have always said the same about the airline industry. I’d rather pay a reasonable fare amount than see aircraft maintenance or personnel training suffer when I’m going up 35,000 feet in the air. So, the public needs to always keep that in mind when pressuring for discounted, cheap trips. X-RAY MAG: Outside of the dive industry, who are your role models and where do you seek inspiration? PH: I have been so deeply focused and involved in the dive industry and for so long, I unfortunately cannot point to any individual I can say gives me inspiration. I do, however, look to huge companies, handling thousands of customers for inspiration and direction—companies such as Disney World, Royal Caribbean Cruise Lines, any major airline—comparing our U.S. airline operations to some of the overseas (Asian in particular) airline operations, etc. There is so much to be learned from these companies, and some really do inspire you to the next level.